Freedom Side's efforts to turn cultural "moments" provoked by police brutality into the grassroots democratic politics they envision have begun in earnest. 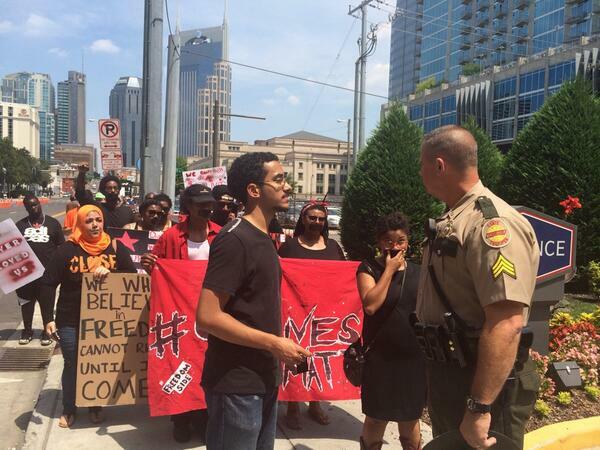 On a summer day last June, a group of around 100 young black and brown activists gathered to welcome the National Governor’s Association to Nashville. The cadre organized a silent march — their mouths taped shut to symbolize their silenced perspective — through downtown Nashville’s commercial district to the Omni Hotel, where the association held its four-day biannual summit. The young black and brown activists descended on Nashville to stand together in resistance against the policies that criminalize them — policing practices that have the effect of racial and socio-economic profiling, like “broken windows” policies; excessive drug sentences and drug enforcement in low-income communities; the systematic separation of immigrant families made more efficient by the post-9/11 creation of Immigration and Customs Enforcement within the Department of Homeland Security; and the perverse social incentives created by increasing privatization of prisons and detention centers. After a failed attempt to send emissaries into the conference, five of the activists stepped forward — nearly a month before the unarmed black teenager Mike Brown would be killed in Ferguson — to unfurl a banner that read, “Our Lives Matter.” All five were arrested for trespassing — four members of the OSA along with one member of the Florida-based Dream Defenders. “We were there to talk about criminalization, and they said, ‘OK, we’ll criminalize you,’” said James Hayes, political director of the OSA. Hayes and Davis were two of the five activists arrested. Hayes would be invited, along with six fellow activists, less than four months later, on December 1, to a meeting at the White House with President Obama to discuss similar issues of black and brown youth criminalization. Although the politics of the involved groups are not monolithic, the consensus view holds corporate capitalism and neoliberal politics as the root of many of the problems they want to change: institutional racism, the pervasive poverty and police presence in minority communities, and the absence of genuine democratic participation in our politics. Their activism foregrounds the experiences of the most marginalized — gender non-conforming people, women and the formerly incarcerated — as part of the attempt to build grassroots democratic power capable of breaking through our corporate-controlled political process. First, they’ve set to educating and organizing their communities, while exploring cooperative and community-based economic institutions that can provide goods and services to their suffering communities right now. The network traces its roots to the 50th anniversary of the March on Washington in August of 2013. The three youth speakers scheduled on the program — Phillip Agnew, executive director of the Dream Defenders; Sofia Campos, board chair of United We Dream; and Alayna Eagle Shield, a Lakota leader with the National Congress of American Indians — were scrapped at the last minute due to time concerns. The commemoration — with a VIP section, event security and boundaries to contain the crowd — symbolized for the young leaders the disconnect between the civil rights legacy institutions and the continued daily struggles of the communities they purport to represent. Many of the most active groups within Freedom Side formed after the murder of Trayvon Martin — including the Dream Defenders, Black Youth Project 100 and Million Hoodies. Publicity surrounding the Trayvon Martin case was the first movement-building “moment” — or a time a large portion of society becomes aware of a problem and is open to supporting solutions — for the coalition. Others had already been working on educational inequity (Ignite NC, the Youth Organizing Institute and the NC Student Power Union) the criminalization of immigrants (United We Dream) and gender non-conforming people (GetEQUAL), or some combination of many of these issues — like the OSA and Make the Road New York. A second “moment,” inspired by community resistance in Ferguson, would establish a model for community-based resistance and bring the youth-led racial justice movement the mainstream attention it has today. Tory Russell is a co-founder of Hands Up United and one of the young activists who organized the first protest the night Mike Brown was killed. He and other young activists were inspired to take action by the example set by up-start youth groups like the Dream Defenders, who marched on the Sanford, Florida police station and would eventually occupy the state capital after George Zimmerman was found not guilty. “I needed to stop being a guest or a fan or a watcher and become a participant,” he said. Some of the groups that led the protests and are organizing in Ferguson, like Hands Up United and Millennial Activists United, have become involved with the network. Many of the same people active within Freedom Side have developed horizontal relationships with other emerging racial justice coalitions, like the Black Lives Matter organization, which was also founded following the killing of Trayvon Martin by seasoned activists Patrisse Cullors, Alicia Garza and Opal Tometi. Although the organizations possess overlapping social analysis and missions, they are going about building movement institutions differently. Black Lives Matter is an open-sourced network intent on facilitating the development of local grassroots groups capable of developing their own capacity and determining their own strategies — it now has 26 chapters. Freedom Side is more a network for collaboration between different individuals and groups. Protests have been organized under the Freedom Side banner, including an October action in Orlando at a meeting of the International Association of Police Chiefs. The network has also mobilized to support actions led by involved groups, like the OSA-assisted protests and organizing in Beavercreek, Ohio following the police killing of John Crawford, an unarmed 22-year-old black man. And Freedom Side has held meetings to plan protests and organize strategies for this summer, and events like last summer’s Youth Congress at the 50th anniversary of the Mississippi Freedom Summer. While this new generation of activists tends to be compared in the mainstream media to those of the civil rights era, they differentiate themselves from their forebearers in an important way: They are very critical of the movement’s hierarchical, male-dominated leadership and opt instead for democratic leadership and organizational structure built upon participation from people of all races, genders and creeds. The new generation is also reviving the often-forgotten radical core of the civil rights movement’s social analysis: economic justice as a necessary condition for racial justice. This radical politics is rooted in an underlying, seemingly permanent, economic crisis generated by long-term trends like historical black and brown unemployment double that of whites, centuries of corporate and governmental housing discrimination, and decades of public disinvestment in K-12 and higher education — all of which have helped maintain a racial wealth gap unchanged since the civil rights era. Although the crisis is largely ignored by mainstream society, an institutional subculture, committed to reviving and keeping alive the American social justice activist tradition, has helped to develop the younger generation. One such group, Black Organizing for Leadership and Dignity, or BOLD, recommitted itself to developing black social justice leadership in the aftermath of the election of President Obama, which emphasized for so many black activists the limitations of the politics of representation. Garza, Cullors and Tometi first began working together as members of the BOLD program, which, since 2011, has trained around 100 black activists annually in gatherings that connect black activists from around the country. Other progressive organizations have also helped to empower the younger generation. Civil rights groups, like the Advancement Project, the NAACP and the Southern Poverty Law Center, have helped organize town halls for popular education, offered institutional support for direct actions, and provided support for legislative initiatives, like the Trayvon Martin Civil Rights Act promoted by the Dream Defenders. The Wildfire Project, an activist training organization formed in the wake of the Occupy movement, and Training for Change have trained leaders from many of the groups, including the OSA, the Dream Defenders and United We Dream. The United States Student Association and People for the American Way — through its Young People For (YP4) Fellowship — have put young activists in contact with one another. And the Service Employees International Union has employed young activists organizing low-wage workers and offered direct financial support to the Dream Defenders and United We Dream, through the labor coalition Change to Win, in the early stages of both organizations. Nurtured by what remains of American progressive social justice infrastructure, the Freedom Side generation stands emboldened by the ongoing crisis of black and brown communities. They now face the long and hard road of turning the cultural “moments” provoked by police brutality, which have reintroduced racial inequity to the mainstream discourse, into the grassroots democratic politics they envision. Sofia Campos and Phillip Agnew first met over the phone before the commemoration of the 50th anniversary of the March on Washington, connected by a mutual friend associated with the YP4 Fellowship, of which both are alumni. They discussed the similarities of their childhoods — Campos an undocumented immigrant growing up near Los Angeles, who learned of her legal status only when she found herself ineligible for financial aid to college, and Agnew, a young black man living near Chicago where poverty, unemployment and mortality rates far surpass national averages. “It immediately felt like family,” Campos said. The alliance between black and undocumented brown youth represents the groundswell forming at our society’s margins, the growing recognition by marginalized youth of the similarity of their experiences and the power they can build by coming together. And these connections have begun to be made — a shared consciousness is developing among low-income students subjected to a school-to-prison pipeline that can turn a note passed in class into jail time and house arrest; young black and brown mothers making poverty wages in the fast food industry; felons who often enter prison as teenagers and leave as second class citizens, unable to vote and unprotected from employment and housing discrimination; gender non-conforming people facing record numbers of hate killings; and undocumented students working their way through college on jobs that don’t require a social security number, taking off every other semester to save up money, all the while hoping they — or their parents — won’t be found out and deported. Groups like the Dream Defenders, Black Youth Project 100, and the OSA have been spreading this intersectional consciousness in their communities through relational organizing, which entails meeting people where they are and soliciting their input, rather than asking them to sign on to a predetermined activist agenda. Similar democratic decision-making processes have been inscribed into many of the organizations themselves. “In order to make decisions, we have a democratic decision-making process — folks have a sense of ownership,” explained Charlene Carruthers, national director of Black Youth Project 100. History is one way the young activists develop a sense of what is possible. Hayes recalls how his interest in social analysis and black history in college — and first-hand experience with the 2008 Obama campaign and the Ohio State University Occupy encampment — led him to rediscover some of the books his parents had always tried to get him to read on subjects spanning Marcus Garvey to the Black Jacobins of the Haitian Revolution. The African American struggle for freedom is celebrated, of course, from Nat Turner’s slave rebellion to Ida Well’s advocacy for women’s suffrage and journalism documenting lynching during the nadir that followed the defeat of Reconstruction. Many look to the group-centric leadership principles of the Student Nonviolent Coordinating Committee and civil rights-era activists largely left out of the mainstream cultural memory, like Ella Baker, Fannie Lou Hamer, Bayard Rustin, Dianne Nash and Bob Moses, among many others. Poverty and its social consequences have moved to the forefront of much of the popular education and organizing done by the Freedom Side groups. “We have to make sure that people have a living wage, that people have access to quality and affordable housing and education, and we have to be sure that people have access to quality and affordable health care so that they can feel well,” said Jose Lopez, lead organizer with Make the Road New York, and one of the activists invited to the White House in December, who is currently serving on President Obama’s Taskforce on 21st Century Policing. The recent police and vigilante killings of black and brown people — Trayvon Martin, Renisha McBride, Eric Garner, John Crawford, Mike Brown, Akai Gurley, Tamir Rice and many more — are seen by this generation of activists as an extension of the economic deprivation found in low-income communities, which must make due without the resources needed for living-wage jobs and adequately funded public schools. Lacking the purchasing power to attract investment from the corporate-managed economy, these communities are left with payday lenders standing in for bank branches, corner stores for supermarkets, and rent-to-own business for basic furniture and appliance retailers. Interactions with the police are seen as only the most violent manifestations of political attempts to essentially ignore poverty and income inequality and to alleviate their social consequences through policing. This policy choice to police poverty is widely understood among this generation of activists as an attempt at population management by a political-economic status quo that would rather poverty be neither seen nor heard. Demands issued by Ferguson Action, an online network broadcasting the movement-building work inspired by resistance in Ferguson, capture Freedom Side’s recognition that economics is at the heart of the policing and social problems faced by low-income, minority communities. In addition to demanding immediate policing reforms, including the end of mass incarceration and “broken windows” racial profiling policies, the group is calling for universal access to employment, shelter, health care and education. The demands seek to correct our society’s model for allocating resources, which produces a deranged reality. Entire communities live in material deprivation and unemployment remains high, especially in places like Ferguson and West Baltimore, where black unemployment rates exceed 25 percent. Yet multinational corporations flush with cash choose to buy back their own stock rather than expand their operations and employ people. Meanwhile, the bipartisan political consensus, dependent on concentrated corporate wealth to finance elections, produces austerity budgets that claim the money needed for public economic investment simply does not exist. This resource paradox was an entry point to activism for D’Atra Jackson — and for many other young black and brown people involved in Black Lives Matter organizing. Jackson, now the organizing director with the NC Student Power Union, was born and raised in Philadelphia with two sisters by her single mother. She grew up going to public schools that “look very similar to juvenile centers and jails,” with ID scanners and metal detectors at the entrance and a permanent police presence. Thinking the violence that surrounded her was caused by boredom, Jackson went to Cheyney University hoping to return to her community as a recreational director. After moving around for a couple of jobs, Jackson decided to return to school in the fall of 2012 for a graduate degree at Florida International University, where the Dream Defenders were beginning to build their Miami chapter. She started to get involved with the protests surrounding the killing of Israel Hernandez, a young Colombia-born artist killed by a police officer’s stun gun, and was instrumental in the founding of the Dream Defenders’ FIU chapter. Unable to find a job in Miami after graduation, Jackson moved to Durham, North Carolina to be near family. 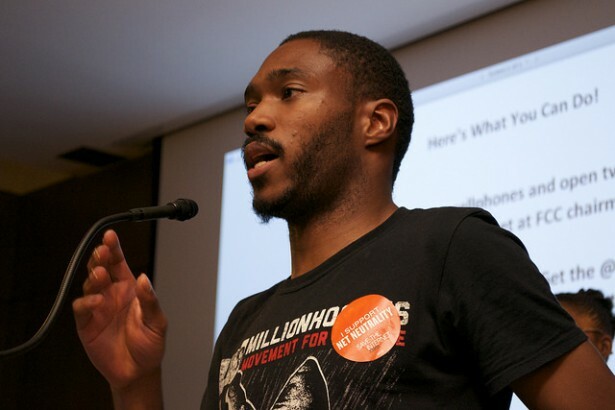 After just a couple of weeks, some members of the Dream Defenders came to Durham for the February 2014 “Moral Monday” march, where Jackson met members of Freedom Side groups from all around the country, including Bryan Perlmutter, head of Ignite NC. One thing led to another and Jackson jumped at the opportunity to become a field organizer with the NC Student Power Union. 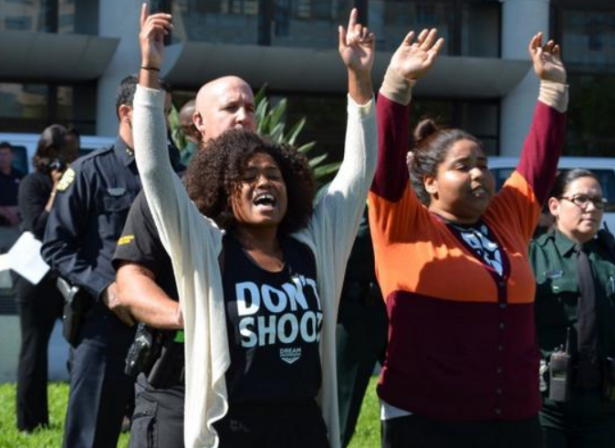 “State violence isn’t just mass incarceration, it’s lack of college accessibility,” she said. With the NC Student Power Union, Jackson travels to North Carolina public colleges educating and organizing around their Debt Free UNC campaign. 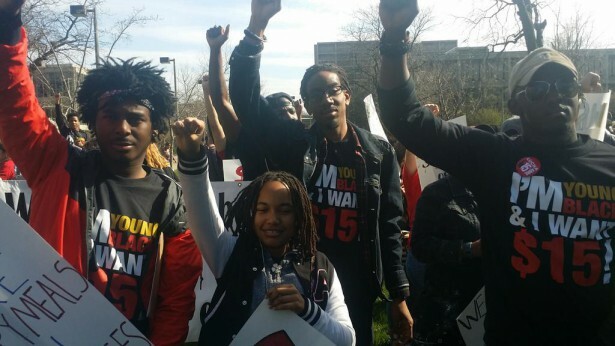 Jackson also educates around the fast food worker Fight for $15 campaign, illustrating, sometimes along with SEIU organizers, the connections between growing low-wage industries and mounting student debt. Jackson’s journey shows the way the Freedom Side network is growing. The consciousness that identifies mass incarceration, student debt and low-wage work as merely different forms of state and economic violence is connecting groups all around the country. And connections breed the desire to learn from one another. Since last summer, Jackson has traveled to Ferguson; to Beavercreek, Ohio to participate in the OSA-led John Crawford organizing; and to Florida for the Dream Defenders’ annual congress. With so many young people directly affected by these issues, the activist base is growing. The Black Lives Matter base is mobilizing, but the current gap between mainstream policing reforms and activist visions for institutional revolution — full employment, housing, education and healthcare as a human right — is staggering. The task for Freedom Side, and all of the groups organizing under the broad racial justice banner, has become one of converting movement “moments” into lasting and meaningful institutional change. Activist strategies for change are focusing on two areas: base building in communities through popular education and organizing, which can eventually support electoral change; and the development of new economic institutions, independent of the political-economic establishment and capable of bringing resources to communities. Still in its early stages, this new Black Lives Matter movement is using protest to build its base, both through person-to-person organizing and as a way to signal, through the media, its significance to mainstream culture. Media coverage — even though it largely ignores poverty and its social consequences — brings legitimacy to the organizing, attracting more people who can join the base. Carruthers points to the community-based policing in Rogers Park on the North Side of Chicago as a positive example of institutional reform. As part of the Chicago Alternative Policing Strategy, or CAPS, which began in April 1993 in five of the city’s 25 police districts, police in Rogers Park hold public meetings to discuss community needs and policing strategies. Homicides in the neighborhood have fallen 71 percent since 1991, the largest such decline in the city. Under Mayor Rahm Emanuel, the program has been denied all funding, keeping with a 15-year trend that has effectively closed the CAPS offices in most districts. Another example is the OSA’s Freedom Hub in Columbus, Ohio. 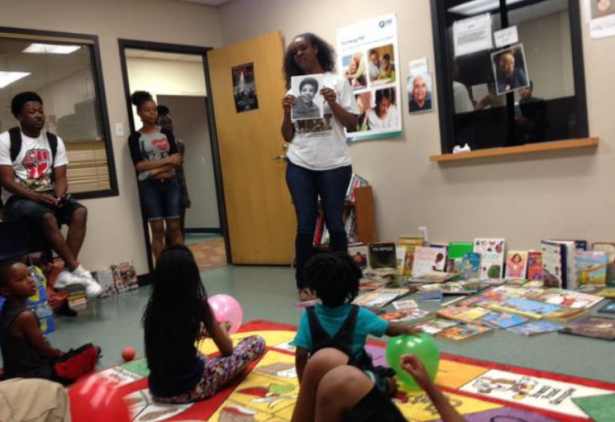 The group’s youth education program is run out of the Freedom Hub, the first of a series of community spaces dedicated to political education and civic organizing that the groups hopes to establish throughout the state. Make the Road New York has been developing local sustainable food infrastructure by partnering with Ecostation NY and the Bushwick School for Social Justice to teach students urban farming. The students learn sustainable farming practices and help to operate a seasonal farm stand. The Dream Defenders are also grappling with strategies that can provide sustainable lifelines. Projects pursued by the Malcolm X Grassroots Movement in Jackson, Mississippi serve as a model for cooperative economic development. The group’s Jackson-Kush Plan, which evolved in part from the campaign to elect Chokwe Lumumba to the Jackson City Council in 2009, aspires to lay the foundation for an autonomous base of power in Mississippi, particularly its eastern Black Belt areas, along three pillars: local democratic people’s assemblies, an independent black political party, and a far-reaching solidarity economy. While in Mississippi for the Freedom Summer commemoration, members of the Dream Defenders met Ed Whitfield, co-founder of the Fund for Democratic Communities, a foundation that promotes economic democracy and cooperative economics in the South. They invited him to teach about cooperative economics at their Freedom Schools over the summer. Whitfield and the Fund for Democratic Communities have helped to launch the Southern Grassroots Economies Project, which produced the CoopEcon 2014 conference that a Dream Defenders delegation attended. One of its first projects is the development of the Renaissance Community Coop in a food desert neighborhood in Greensboro, North Carolina. Other similar opportunities exist for groups to pursue economic development according to models outside of the corporate capitalist and neoliberal paradigms that have largely denied their communities financial investment. Public funds can be used to start worker-owned and community-controlled cooperatives, as they have in Cleveland, Ohio. Public money can be used to establish affordable housing, and stave off gentrification, through land trusts, like the one operated in Boston by the Dudley Street Neighborhood Initiative. And government contracts can be directed toward locally-owned, even cooperatively-owned businesses (as with the Jackson-Kush plan), rather than to huge corporations. Public funds can also be used to establish direct ownership, which can generate money that can be made available for other social endeavors. In California, the Valley Transportation Authority of Santa Clara County owns the land around its transit stops, returning revenue to the city that would otherwise go to private developers. And in Boulder, Colorado, the city is attempting to buy the local energy utility and direct it toward greener sources. Many of the Freedom Side groups are learning about these alternatives and beginning to pursue them as one key element of their larger grassroots democracy program. Although Freedom Side, and more generally the entire Black Lives Matter base, faces significant obstacles to piercing mainstream consciousness, let alone affecting change, its work has begun in earnest. The groups are continuing to educate, organize and to reach people. The Dream Defenders often wear shirts to their actions that read, “Can We Dream Together?” The question — both its content and form — captures the spirit of the Freedom Side network and this new generation of black and brown activists. Mass public protest has begun to eliminate the fear that typically silences marginalized youth. Yet, in a society that for decades has lacked a coherent and aspirational left, youth activists are understandably short on the revolutionary program’s fine print. They are tinkering with new economic modes of organization and are committed to the values of intersectionality and participatory democratic decision-making. But above all, they possess an abundance of guiding questions: What would a world look like that isn’t racist? That isn’t sexist? That is truly committed to restorative, not punitive, justice? That produces for human need, not for profit? That is ecologically sustainable? And most important, how do we create this different world? While this new generation does not pretend to be able to yet answer these questions, the consensus view holds that corporate capitalism and neoliberal politics are the root of not only institutional racism, but many of the crisis we face: the absence of participatory democracy, staggering wealth inequality, looming ecological collapse, and a mainstream media and information culture largely blind to the daily experience at society’s margins. With their popular education and organizing programs, the struggle for freedom of the marginalized in America has begun anew. The groups’ many guiding questions have begun to redefine expectations about our society’s fundamental relationships — between citizens and government, the employed and the employer, and the individual and community. Armed with a political and economic analysis that speaks to so many, the groups continue to build their bases, spreading a vision that frames the status quo, not them, as radical. Actually, freedom and democracy are mutually exclusive propositions. You can have one or the other but not both. Thanks for this wonderful article! I’m so inspired by the work these young people are doing. The questions you mention–What would a world look like that isn’t racist? That isn’t sexist? That is truly committed to restorative, not punitive, justice? That produces for human need, not for profit? That is ecologically sustainable? And most important, how do we create this different world?–are questions I’m asking as well. Its not enough to keep fighting back against every new assault (although we have to do that too)…we have to envision the alternative and make it so inspiring that everyone wants to jump on board. These groups are doing just that!